New content and prizes including a trip to BlizzCon! Tychus Findlay’s Bust Your %&# Workout is all the rage in the Nexus this summer. The greatest heroes in the Blizzard universe are pumping iron and slathering on sunscreen to hit the beach and bare their bulging muscles. Get in on the action with limited-time Skins and Mounts, a fantastic Brawl, and an unprecedented sweepstakes with prizes including tickets to BlizzCon! What are you waiting for? Get out there and Bust Your %&#! Bedazzle your enemies with Tychus’s indomitable beach bod, lighten up with Tracer’s squirt gun-toting Slip ‘N Stream skin, or make an impression all your own with new Bikini Stitches tints. Plus, explore new Surfboard mounts and a treasure trove of Sprays and Portraits! 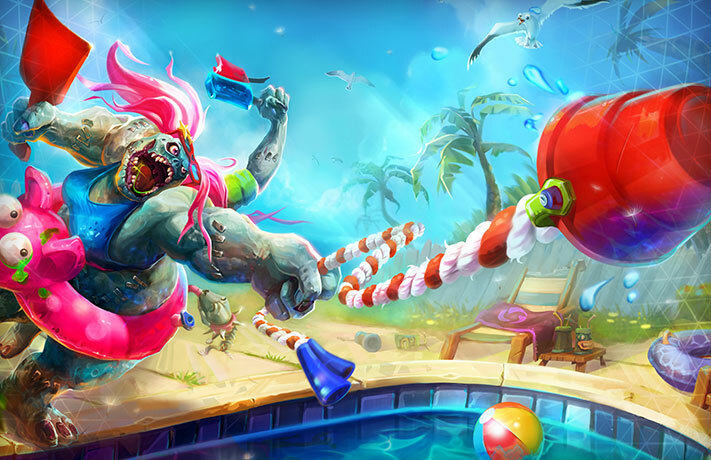 During the summer event, all Loot Chests you earn through progression, Heroes Brawl, or by spending Gems will be Sun’s Out, Guns Out Loot Chests. (The one exception is Hero-Specific Chests, which will remain unchanged.) The limited-time Skins, Mounts, Sprays and Portraits shown above have a chance to drop from Sun’s Out, Guns Out Loot Chests. Stitches made some summer friends—nine other Stitcheses! (Stitchi?) 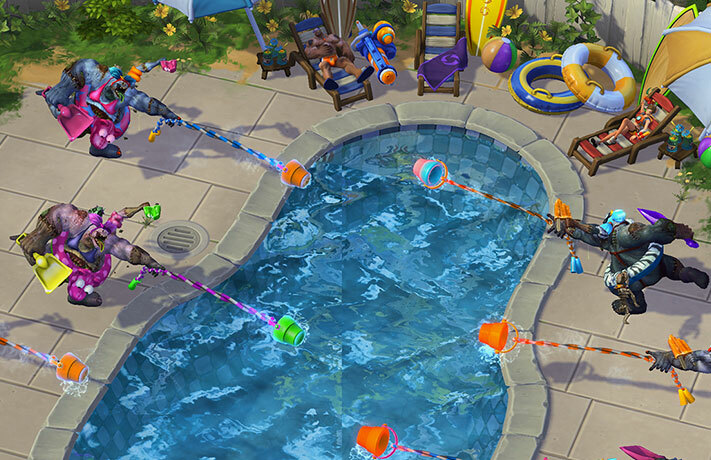 Pull your five opponents across the pool without getting snagged yourself. Hooking an ally or enemy who is already being pulled will kill them instantly—in the case of an ally, denying the enemy team a kill! The first team to 20 kills wins. Complete three Pull Party matches to earn a Sun’s Out, Guns Out Loot Chest. The Pull Party Brawl will be available between June 30 and July 6. All Brawls between June 30 and July 28 will award Sun’s Out, Guns Out Loot Chests. We’re giving away one million Loot Chests each week, plus mind-boggling Rare, Epic, Legendary, and Grand prizes—including BlizzCon tickets! You’ll be entered to win each time you win a game, once per day between June 27 and July 24. See the full rules to determine availability in your area. Summer doesn’t last forever, and neither does this limited-time celebration—get out there and play some Heroes of the Storm before Sun’s Out, Guns Out ends on July 24!